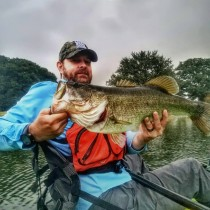 A new camera company has emerged in the action camera market and their latest offering is creating a lot of buzz in the kayak fishing industry. WASPcam, based in Canada, has pushed the envelope in feature and price with two new offerings that launched January 15. Straight out of the box, the WASPcam “Gideon” is possibly the most feature-rich camera on the market. The Gideon records HD video up to 1080p60 (and also 1080p30, 960p60 and 720p120), takes still-images up to 16MPm and has built-in WiFi. You can connect the camera to your iPhone or Android device for live viewing. The Gideon sets itself apart with its wireless wrist remote that gives users a live viewing screen and remote control. The wrist remote connects from up to 15’away, and doubles as a watch. In addition to the camera and wrist remote, the Gideon also comes with two different camera mounts, fog inserts, waterproof and vented backs for the waterproof case, a wall charger, and Velcro strap. Possibly the biggest surprise with the Gideon is the price. MSRP for the Gideon varies slightly, but in most markets it is $319. As more of these cameras reach consumer hands, side-by-side comparisons of video performance in varying conditions will become available. WASPcam’s second new offering, the "JAKD", is piquing the interest of consumers looking for a value-priced camera with plenty of options. The JAKD camera can shoot [email protected] or [email protected] While it may not be ideal for video pros, novice and intermediate videographers can enjoy capturing their adventures without wiping out the bank account. At only $139 in most areas, the JAKD camera is low on price and high on options. The most impressive feature is the 2” LCD touch screen on the back of the camera. The JAKD comes with a waterproof case, helmet mount, handlebar mount, wall charger, and more. Just when you thought it couldn’t get any better, the JAKD camera also has infrared night vision and auto loops when recording; if you didn’t get that shot you wanted in the first pass, keep it running and it will record over it! While I can’t make a formal recommendation because I haven’t tried the cameras yet, the specs and price point for each seem very appealing. For someone looking to getting into shooting some action videos, the offerings from WASPcam warrant a look. Great write up Chris ! I have the WASPcam 9900 and I love it ! Flawless performance ! I'll be purchasing the new GIDEON very soon ! Great to hear! I would love to be able to test one out. How is the battery life on the 9900? Looks like a pretty good competitor for the gopro. Waiting for some more youtube reviews.